DeSScipher is the acronym for “to decipher the optimal management of systemic sclerosis”. The aim of this project is to improve the treatment strategies for systemic sclerosis, and therefore to increase quality of life in the future. It is an international project of five observational, non-interventional studies, conducted over a period of at least 3 years. What does “observational” mean? In contrast to an “interventional” study, which is a “planned study” on patients that, for example, compares a novel drug vs. placebo for a disease, an observational study addresses similar questions, investigating the effects of licensed drugs in real-life care for patients, but an observational study only monitors closely a patient’s disease, not intervening, and explores in this way whether an existing treatment may be beneficial or not. The patient stays on his or her individual medication, in routine clinical practice, and this medication is only changed by the patient’s medical needs, and not for reasons relating to participation in the observational trial. WHICH ORGAN MANIFESTATIONS WILL BE INVESTIGATED IN DeSScipher? severe heart disease (observational trial 5). However, while these are the main objectives, several other relevant clinical questions will also be addressed based on a large cohort of patients. WHERE CAN I GET MORE INFORMATION ABOUT DeSScipher? 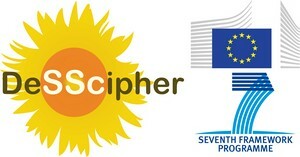 A homepage www.desscipher.eu has been implemented, with a special section of information for patients. This homepage will be expanded in future, but you will already find there a patient information brochure containing basic information about the observational trials. HOW CAN I PARTICIPATE IN DeSScipher? Originating from the leading DeSScipher partner centres, every EUSTAR centre and also all other SSc patient care centres can include their patients. Contact details of currently participating centres are provided on the homepage. If your centre has not already contributed to DeSScipher, and you want to participate, just ask if they wish to become a contributing centre. If you want to directly contact the central coordination centre of DeSScipher for help, our email is DeSScipher@uni-giessen.de. As FESCA aisbl is also a founding DeSScipher partner, the national FESCA representative or your local SSc patient association can provide you with additional information. (Find your local European patient association here). We hope this information is helpful to you, and that you will want to participate in driving forward the success of the DeSScipher Project. This study should not be “science on you”, but “science for you” to improve the quality of your daily life.